Gluttony is the overindulgence and overconsumption of anything to the point of waste. Will this solve all your problems? ...don’t even consider microservices unless you have a system that’s too complex to manage as a monolith. The majority of software systems should be built as a single monolithic application. Greed is applied to a very excessive or rapacious desire and pursuit of material possessions. Sloth is sometimes defined as physical laziness, but spiritual laziness is emphasized. Continuous life or death cycle? Lust is an intense and uncontrolled desire. Always use the hottest ! "A container is just a process"
Pride is identified as believing that one is essentially better than others. Envy is the discontent towards someone's traits, status, abilities, or rewards. Wrath also known as "rage", may be described as inordinate and uncontrolled feelings of hatred and anger. 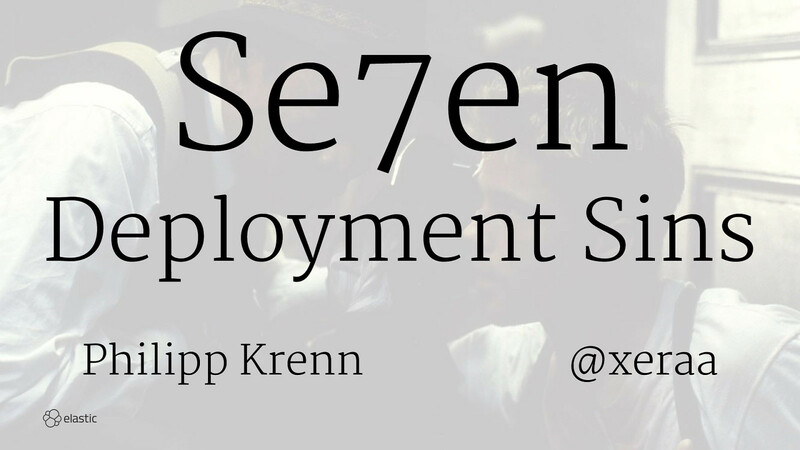 View Se7en Deadly Deployment Sins. Gluttony: Adding all the dependencies — both in size and number. Greed: Yes, I want to use the biggest and slowest application server possible. Lust: Of course I'm using containers, microservices, and every latest trend for every project! Pride: Once something is in production it's purely an ops problem. Envy: Why should I rely on an external library, when I can lovingly handcraft it all myself? Wrath: Logging and monitoring are for the faint of heart!